GY high pressure briquetting machine is a kind of pelletizing machine which can feed various kinds of dry and wet powder through the preliminary pressure device compulsorily into the roll press area and make into high bulk density ball. It is mainly applied in the coal, mining, metallurgy, fire-resistant materials, construction materials and other light metal industries. The high pressure briquetting machine is mainly used for ball forming of colored and ferrous metal ore powder, and directly into the furnace for smelting to increase the added value. Any metallurgical industry waste, auxiliary materials need to be on the furnace, all need high pressure ball machine to complete. For example: quicklime, dust ash, sewage, oxide scale, steel slag, iron fine powder, aluminum ash powder, silico-manganese ore powder, and so on. The newly developed high pressure ball press machine of our factory has obtained the national patent, and the pressure can be increased several times. The important structure is that the original feed is basically converted into a three-way feed. The main roller and the secondary roller are pressed to compact the hemisphere, and the two hemispheres compacted with the rotation of the main roller are fed in the middle, and a second press is performed, thereby multiplying the pressure. The machine has obvious effects on loose materials, such as coke powder, oxide scale, dust ash, sludge, etc., and the effect is extraordinary. The main body of the high pressure ball press machine is powered by an electromagnetic speed regulating motor, which is transmitted to the drive shaft through a pin and pin coupling through a pulley and a cylindrical gear reducer. The drive shaft and the passive shaft ensure synchronized operation through open gears. The passive bearing housing is equipped with hydraulics at the rear. The screw feeding device of the high pressure ball press is driven by the electromagnetic speed regulating motor, and is rotated by the pulley and the worm reducer to force the pressed material into the main feeding port. Due to the constant moment characteristic of the electromagnetic speed regulating motor, when the amount of material of the screw feeder is equal to the amount of material required by the main machine, a constant supply pressure can be maintained to stabilize the pellet mass. If the feeding amount is too large, the feeding device is overloaded; if the feeding amount is too small, the ball is not formed. Therefore, the skilled operation technique is an important condition for ensuring the normal operation of the ball. The high pressure ball press mainly uses a hydraulic pump to drive high pressure oil into the hydraulic cylinder to cause axial displacement of the piston. The front joint of the piston rod is placed on the bearing housing to meet production pressure requirements. When the feed between the two pressure rollers is too much or enters the metal block, the hydraulic cylinder piston rod is under pressure overload, the hydraulic pump will stop, the accumulator will buffer the pressure change, the relief valve will open the oil return, and the piston rod will be displaced. The gap between the pressure rollers is increased to allow the hard objects to pass through the pressure roller, and the system pressure returns to normal, so that the pressure roller can be protected from damage. The machine can adjust the pressure according to the requirements of the pressure ball density, and the production is flexible. Luoyang Zhongyuan Mining Machine Manufacture Co., Ltd. is the first specialized enterprise of manufacturing briquetting machine in domestic. 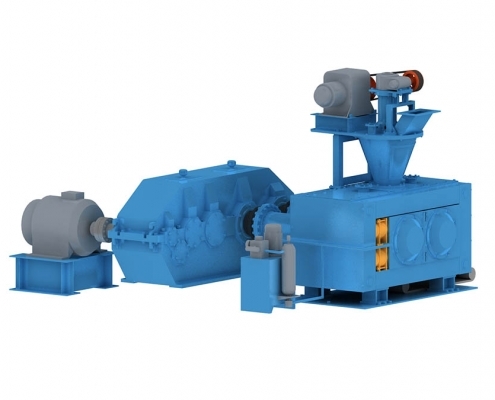 Since the first large high-pressure briquetting machine GY750-300 was finished trial-manufacture in 1989, the company has formed three series, more than twenty models after many years of research, tests, and improvements. The structure, performance, quality and service life of products have reached world-advanced level. Luoyang Zhongyuan Mining Machine Manufacture Co., Ltd. has become a professional plant integrated of development, research, test, design, manufacturing and service for high pressure briquetting machine in domestic with the most perfect ball test machine and the related laboratory. Our plant can confirm the process flow, process parameters and finish model-selecting, design and manufacturing of briquetting machine based on the test that raw materials are provided by users. Our plant is the production base in China, providing the most complete and latest briquetting machine. Hydraulic plant is placed independently with the function of pressure-adjusting and protective function when overloading.